Unlike other forms of art, jazz needs no preamble or preliminary words, and that is precisely how two musicians, who were complete strangers a moment before, can establish an almost instantaneous connection. This is how what we call jazz has been working for over a century, and maybe explains its stubborn longevity. This is what the Spanish trumpeter David Pastor and Italian bass player Massimiliano Rolff must have felt when they first met, as they had never done anything together before. Attracted by the possibility of reflecting each other, like two mirrors with the same perspective, they could not help but together explore all they had in common. A subsequent tour sealed this complicity and mutual admiration allowing the two musicians to share their knowledge, life experiences and references, in a series of live sessions that soon led them to a recording studio. The resulting record encloses the fruit of this synergy, with a fresh, radiant, bright and revealing sound, a celebration in honor of jazz, defining the personality of the musicians, from head to toe. 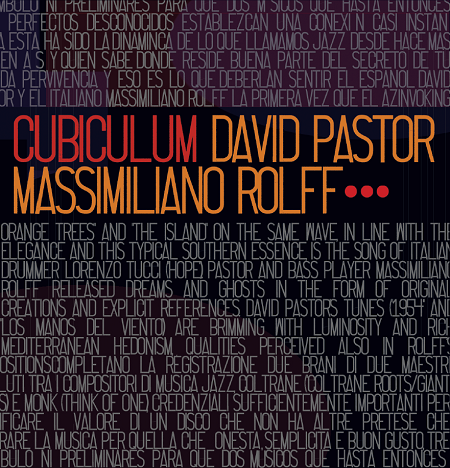 Invoking the “cubiculum” as that space where musicians gathered to share talent and creativity, the trumpeter David Pastor and bass player Massimiliano Rolff released dreams and ghosts in the form of original creations and explicit references. David Pastor’s tunes (“1954” and “Los manos del viento”) are brimming with luminosity and rich Mediterranean hedonism, qualities perceived also in Rolff’s compositions (“Above the orange trees” and “The island”). On the same wave, in line with the elegance and this typical southern essence, are the songs of pianist Alex Conde (“Jungle street”) and Italian drummer Lorenzo Tucci (“Hope”). The recording is complete with two tracks of two absolute masters in jazz composition, Coltrane (“Coltrane roots/Giant Steps”) and Monk (“Think of one”), which alone are sufficient credentials to demonstrate the value of a record that simply claims to show music “for what it is”. Honesty, simplicity and good taste, three elements that may seem trivial, but are unfortunately hard to find among the avalanche of today’s indiscriminate musical proposals. So there they are, the elements that make ‘Cubiculum’ an absolutely first class album.